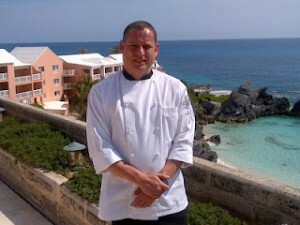 The Reefs Hotel has welcomed Chef Karl Blunden as its new Executive Chef. This is his first time in Bermuda and he is already quite impressed with the destination. “I have traveled all over the world and never experienced as warm of a welcome as I did when I arrived here,” he comments. Originally from England, Chef Karl began his career in London before serving in culinary management roles in Egypt, St. Lucia, Hong Kong and the United Arab Emirates. For the past four and a half years, he was the Complex Executive Chef at The Four Points by Sheraton in Dubai where he oversaw 11 dining venues and room service at two hotels. During his tenure there, he was honored with the Starwood Europe, Africa and Middle East Division President’s Award. Chef Karl’s culinary creations favor an Asian influence, which he says fits well with local island ingredients and seafood. His goal at The Reefs is to use as much local produce as possible. He also plans on adding his culinary touch to new menu items soon. Hi chef nice to see your face.this is bimal from dubai. Hi! I want to know if we ate related ? What were your grandparents names? (: thanks!